The Seat – Buy the Book The Seat Now! Whether you’re trying to get a seat at the C-Suite table, trying to get your foot in the door of your dream job, trying to make a sale with a client, or asking for a promotion or a raise, getting “The Seat” is one of the biggest challenges you will face in your career progression. In my new book, The Seat, I pull from my 30 years of business experience, my journey to earning an executive seat, and the strategies, setbacks, and lessons I learned as a woman, a person of color, a single mom, and an HR professional. It was a road wrought with disappointments, setbacks, haters, failures, being marginalized, unjustifiably criticized, and held to a different standard. Yet it is a story of perseverance, making sacrifices, compromises, right decisions, staying focused, becoming fearless, and being determined to succeed in spite of the obstacles. You’ll walk away with an abundance of ideas and strategies on how to add value to your organization and strategically position yourself for whatever seat you seek. This book is a necessary read for anyone who is overlooked and undervalued while over-performing and still not invited to the table. "Every CEO in Corporate America should read The Seat: How to Get Invited to the Table. It illustrates how a diverse, multicultural and multigenerational workforce is crucial to our country’s future business success and competitive position in a global economy. It also provides a compelling case for how we should ensure that all talent in our workplaces have greater access, opportunity and inclusiveness at the table." "Dr. Shirley Davis has done it again with her second book that is critically needed for anyone, man or woman of any age who is navigating the world of work. Dr. Davis draws on her vast experiences over the years to share her pearls of wisdom. If you are at a loss for how to get a “seat” or want a new and better “seat,” you should consider this book a must read." 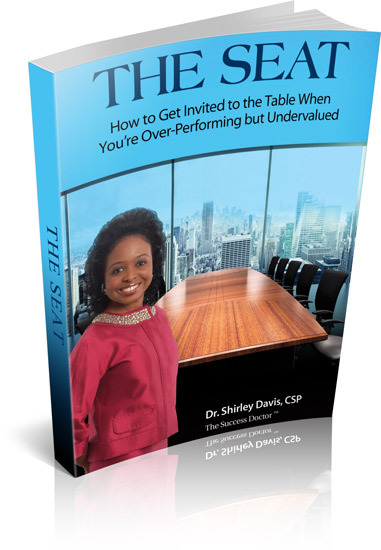 In the book, The Seat: Strategies for Getting Invited to the Table When You’re Over-Performing but Undervalued, instills basic strategies for success in getting and keeping a seat at the executive table in a diverse and multicultural, technology-driven world. Dr. Shirley Davis incorporates the perfect mix of stories of positive impact and struggles that led to goals of improving, developing, and reinventing ones-self for any organization. Dr. Davis writes from the perspective of a successful businesswoman, providing advice and examples from her own journey toward achieving new possibilities in executive presence. Candi Castleberry-Singleton Founder and CEO, Dignity & Respect, Inc.